Today I found out why golf balls have dimples. It turns out, somewhat counter intuitively, those dimples significantly decrease the drag on the golf ball as it flies through the air, compared to a smooth ball. Not only that, but they also increases the lift somewhat. These two things combined can make the golf ball go as much as three times farther than the same ball without dimples. 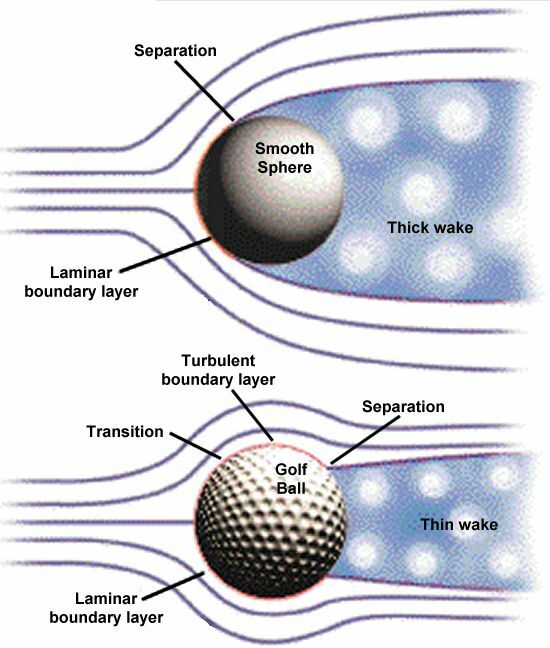 The dimples on golf balls accomplish both of these things by creating turbulence in the layer of air around the golf ball, called the boundary layer. In simple terms, the dimples more or less scoop the air and direct it inwards towards the back of the golf ball. This effectively increases the net air pressure in the back of the ball, which reduces the drag by reducing the pressure pulling back at the ball from behind. This can reduce drag by as much as 50% over a smooth ball. 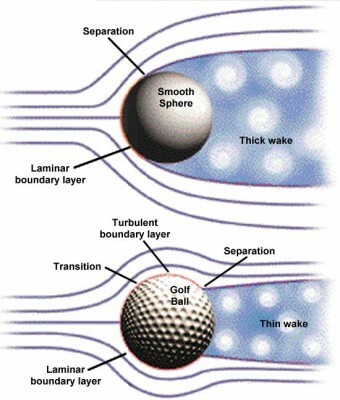 More technically, the streamline flow of air on a smooth ball separates fairly quickly from the ball as it passes over the surface of the golf ball, as seen in the image to the right. This ends up maximizing the size of the wake behind the golf ball, which maximizes the area of lower pressure, creating a large drag. With the dimpled golf balls, this streamline flow remains attached to the surface of the ball much longer which creates a smaller low pressure region behind the ball, thereby significantly reducing the drag on the ball. The dimples also create lift when there is significant backspin on the ball as it flies through the air. This is very similar to how the seams of a baseball create lift when there is backspin. In both cases, the backspin causes the air to move faster backwards on the top of the ball, with the golf ball via the dimples and with the baseball via the seams. This creates lower air pressure above the ball than below, which creates a small amount of lift. A similar effect can also be observed with baseballs and golf balls when a ball has a certain amount of side-spin. Except, in this case, instead of creating lift upwards, it will cause the ball to tail to one side or the other, depending on the direction of spin. This is why balls with this side-spin will tend to travel in a sideways arc through the air. You might be asking yourself, why don’t they then put dimples on planes, cars, and the like to reduce drag? Primarily because creating turbulence in the boundary layer doesn’t always reduce the net drag. It largely depends on the shape of the object and the speed at which it is traveling and things of this nature. 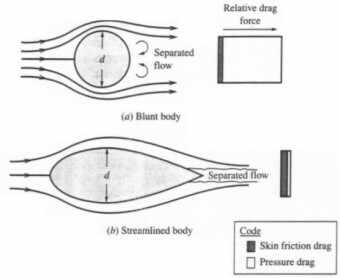 In an object in the shape of a ball, where the primary drag is created by the wake, this ends up decreasing the net drag significantly. In more streamlined objects, such as an airplane wing, they create very little wake relative to the skin friction drag they experience. 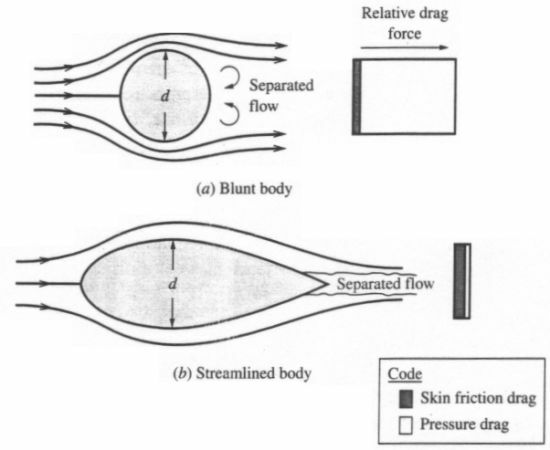 So the dimples wouldn’t help much and, indeed, creating this turbulence would actually increase the streamline drag, which would drastically increase the skin friction while not helping much with the less significant drag caused by separation in the wake. Now, as far as cars go, which tend to not be all that aerodynamically shaped, relative to something like an airplane wing, it has been shown that creating a dimpled surface can decrease the overall drag somewhat on certain designs of cars. However, the difference in fuel efficiency is fairly marginal and hasn’t to date been shown to be near significant enough to warrant sacrificing certain cosmetic aspects of the car, namely covering it with dimples. Most golf balls have between 350 to 500 dimples, though the pattern, depth, and number vary significantly between different manufacturers. 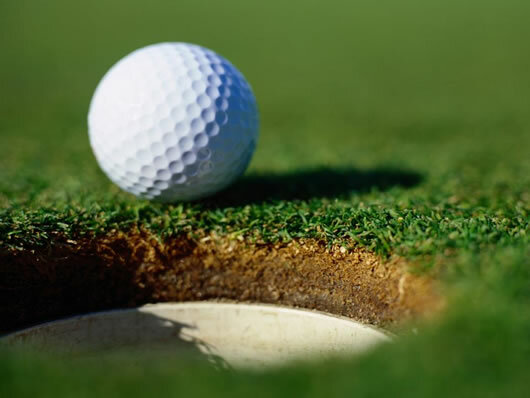 The earliest golf balls were made of wood. This lasted until around the 17th century when it was discovered that a ball that was tightly stuffed with feathers with a leather outer shell then coated with paint would travel further. They would make these balls by boiling feathers and then placing the feathers inside a leather pouch while still hot. Finally they would sew the pouch up. The feathers and ball would then slowly cool with the feathers expanding as they cool while the leather pouch contracts, creating a very tightly packed ball. This ball became the standard golf ball used for over two centuries. So how did someone come up with the idea of creating a ball with dimples rather than one that is smooth? Primarily just through the power of observation, which is still one of the principle ways many golf ball manufacturers create their ball designs. Originally, the above feather ball was replaced by a gutta-percha ball, invented by Rev. Dr. Robert Adams Paterson in 1848. He created this ball out of Sapodilla Tree sap. This sap ended up creating something akin to a rubber ball and was easily shaped when hot. Somewhere along the line people started to discover that old balls which were scuffed would travel further than new balls which were perfectly smooth. Unlike the feathered balls, these guttie balls could easily be hammered to create desirable surface textures. They were also a lot cheaper and more durable than the feathered balls, which couldn’t be used in rain or the like. These factors helped the guttie balls supplant the feathered balls within a few years of their invention. The modern golf ball, with a wound core, was invented by Coburn Haskell in Cleveland, Ohio in 1898. While most of these little anecdotes turn out to be false or are unlikely, supposedly, Haskell was to play golf with the superintendent of B.F. Goodrich, Bertram Work, one day. While waiting for Work to get off work at the plant, Haskell played with a rubber thread, winding it into a ball. When he had a nice ball, he decided to play with it by bouncing it. The ball bounced incredibly well with very little effort and when he showed his golf buddy, Work, what he had made, Work suggested that Haskell put a covering on it so they could use it as a golf ball. These wound balls became incredibly popular and were highly valued until only around the last ten years or so, though they are still used by many today. Around the same time the wound ball was invented, the dimpled design started to become popular. At the time, there were various patterns and textures you could get on a golf ball which would increase the flight time over a smooth ball. Eventually, the dimpled design won out primarily because it seemed to always go further than the other types of texture golf balls. Today, golf balls come in two different primary varieties, recreational and advanced. The advanced balls take a lot more swing power to compress, but are designed to create greater spin. With powerful swings, such as by professional golfers, this will result in the ball traveling much further than the same swing on a recreational ball. However, with a weak swing, about 80 miles per hour or lower, the ball won’t travel nearly as far as that same weak swing on a recreational ball. The principle design difference between these two types of balls is simply that the recreational balls have two layers the the cover much firmer than the core, while the advanced balls have three or more layers and a fairly soft cover compared to the firmer cores inside. It has only been very recently that sufficient computational power has started to become available to begin to mathematically model a golf ball’s flight through the air and how it differs with different texture patterns and the like. Even now though, no “perfect” pattern has yet been proven to be so because the problem is still incredibly computationally intensive, requiring significant time on even the fastest super computers in the world. For reference, the fastest personal computers in the world today would take around 15 years just to compute a fraction of a second of a golf ball flying through the air. Parallelizing these problems in order to be used on super computers is no trivial thing either, though some progress has been made there. For instance, Nikolaos Beratlis at the University of Maryland has successfully developed golf ball flight algorithms which can relatively efficiently utilize multiple processors on the world’s supercomputers. In one such simple run, they managed to run one simulation that only took 300 hours using 500 processors. One new design tweak that has come from these more scientific methods of calculating the best design for a golf ball is to use polygonal dimples, rather than circular dimples. This has been proven to reduce the drag over the classic circular dimples. The direction, velocity, spin rate, etc. of a golf ball are all determined by the split second interaction the ball has with the club when it’s struck. This interaction typically lasts less than a millisecond. The fastest golf ball ever hit to date was hit by Canadian Jason Zuback who managed to hit a golf ball 204 mph, beating the previous record of 188 mph which was held by José Ramón Areitio. So living in Texas and having your car pummelled with golf-ball sized hail on a regular basis is a good thing after all. I’ll just have to park my car out on the street when the hail storms come through. If an aeroplane wing had dimples on top surely the airflow over the wing would depressurise the dimples pulling the wing up and pulling the boundary layer down thereby helping to pressurise the wake reducing drag and improving lift. Blisters on the top leading edge would add a second dimension to the Venturi of the wing helping to accelerate the airspeed on top of the wing and reduce pressure further.